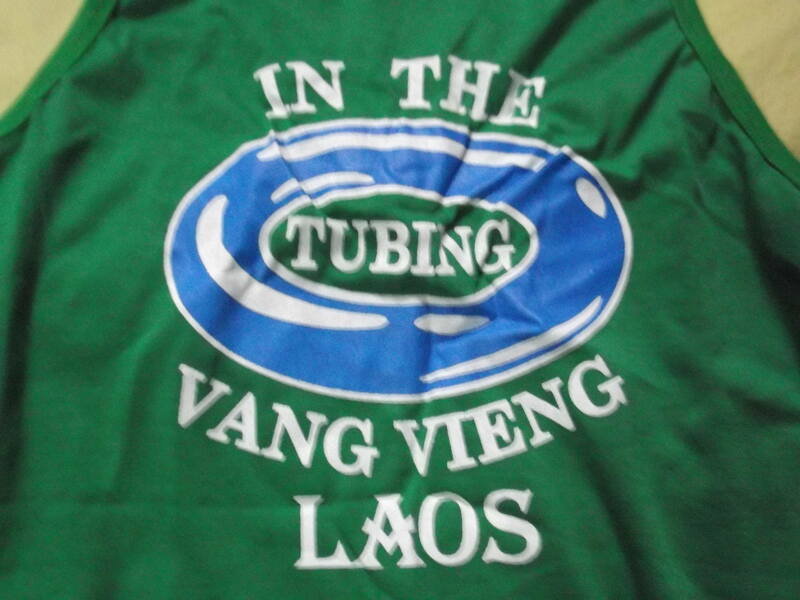 How Not To Go Tubing in Vang Vieng Laos!! 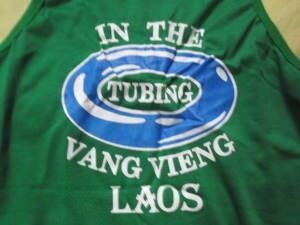 How not to go tubing in Vang Vieng! Where did it all go wrong? 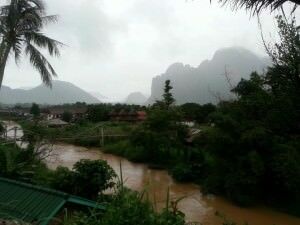 The epic views over the Nam Song river from Vang Vieng were sadly lost on me! So all was going well in Laos after some border mishaps and myself and my travel buddy Chaz Fitsimmons (a real Belfast Boy) made it to the dreamy magic of Vang Vieng. We found a hostel, some food and a Happy Hour on Beer Lao. Sorted! Then we met up with an English guy called Nick and a Spanish girl called Marina. We partied the night away in the many bars in Vang Vieng including the magic “Island Bars” where I met a dude from Hong Kong called Steven and a Northern Irish girl from Fermanagh, it was all like being 17 again. It a great social night out with endless fun. Flame diving and drinking buckets of whiskey in the bucket bar and we planned to do the tubing the next day. Again, all good so far! I got back to the hostel and slept. 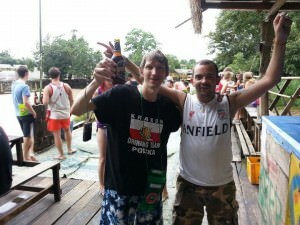 The calm before the storm was a morning Irish coffee with Nick and Chaz in Vang Vieng. LAOS. Then we woke up early morning and had to move hostels, we got sorted and also ended up having a French baguette and Irish Coffee breakfast to get ready for the day of tubing! 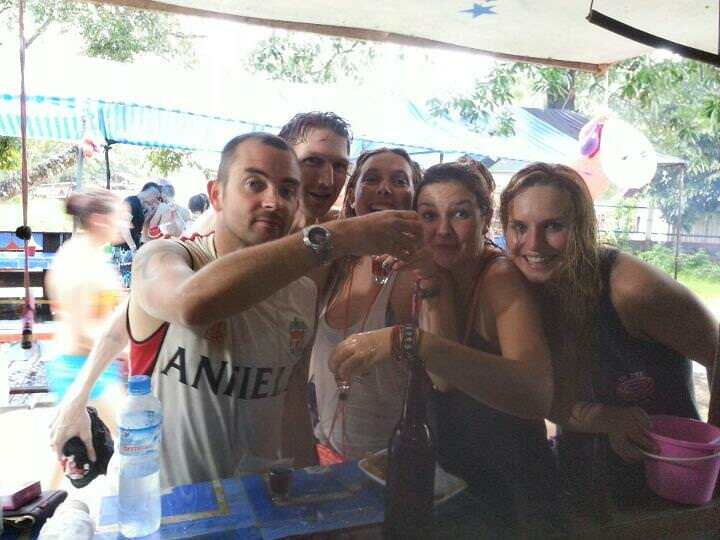 Our English mate Nick had rounded up a few others and while Chaz and I played pool in a bar in Vang Vieng, they came to pick us up in a truck to go tubing. We didn’t pay a penny so far and had arrived at the first bar of the tubing. Free shot on arrival. Too good to be true really, we still hadn’t paid anything but Chaz and I got on the beer at this bar, which is when I first bought a drink. 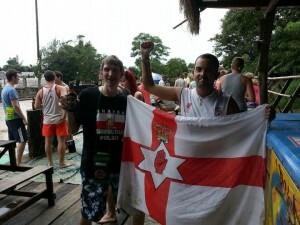 Chaz the Belfast Boy partying on the tubing, before it all went wrong for me! What followed was just an awesome few hours. I met tons of new people and we were having fun, “tubing” but hold on…we weren’t really tubing yet. We had played mud volleyball, danced away and thrown frisbees at cans. It was time to go tubing. You might have heard that “tubing” is really just drinking, and that proved to be the case. You will spend more time in the bars than on the tubes. Earlier in the day I had bought a green waterproof “Tubing Bag” for my wallet and my camera (plus one spare memory card). That was all I needed for the day – wallet and camera. The stupidest thing I did was I brought ALL my cards and money with me (including my Hong Kong ID card and my currency in HK Dollars, US Dollars and Laos Kipp). The reason I brought it all was I didn’t trust leaving it in the hostel. First mistake was bringing it all with me. Second mistake was buying that green bag. By the time bar four arrived, as I was reeling myself in on the tube, I got distracted by a stupid green bottle on a rope which I thought was my waterproof bag. As I reached for it, I lost my way into the bar and turned round to swim across. It all happened very quick and the currents on the stream are fast, believe me. Once something disappears down the river, it’s gone. 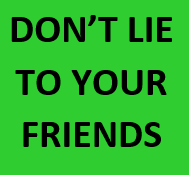 My green waterproof bag (which was attached round my neck) had disappeared forever. 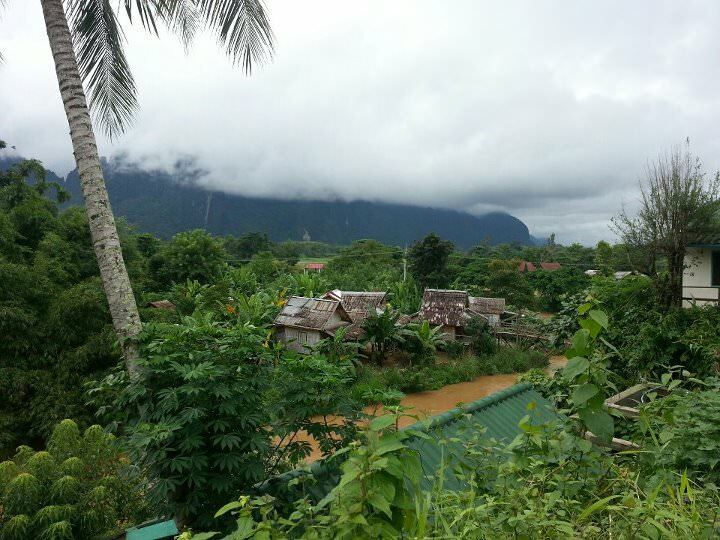 The Nam Song River, part of the Mekong, in there somewhere is my camera and my wallet…oops! Going with it was my entire money and credit cards for the entire trip, plus 3 other ID cards and my camera full of memories of photos and videos. Oh dear! And I was now stranded in a bar in Vang Vieng. With other people of course. I met up with Chaz again in the bar and he too had lost his wallet but kept his phone. He luckily didn’t bring all his cards with him and I still have no idea why I risked taking everything into the river that day. Maybe to teach myself a lesson and realise I was wrong. 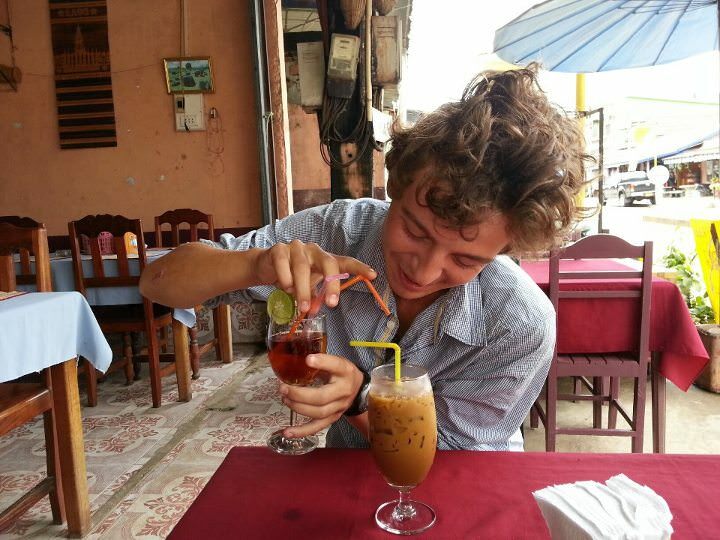 I trusted myself more than I trusted the hostel, and I was wrong to do that. 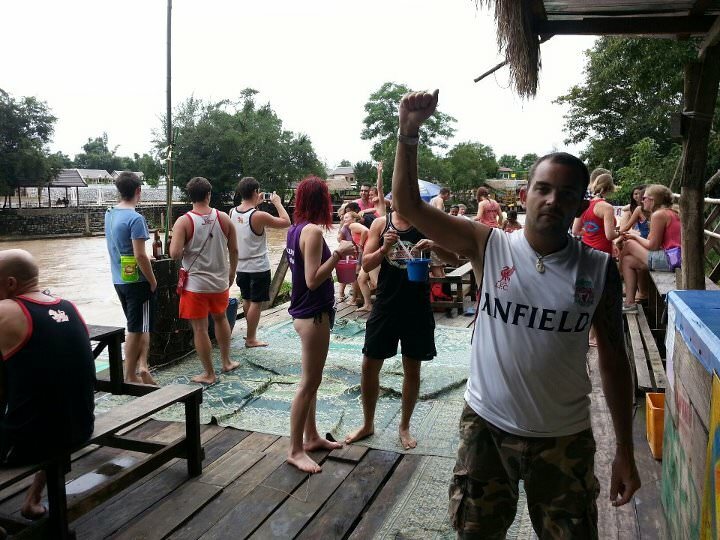 My mate Chaz bought me a drink in that next bar as did an Irish girl and then I drank water, grasping a pair of flip flops and my travelling Northern Ireland flag. It was odd to me. While my camera and wallet were busy floating away on the Nam Song, I managed to grasp on and keep a flag (my travelling Northern Ireland flag) and a pair of flip flops. I didn’t even want the flip flops. Later I would learn I also picked up an ear infection from swimming in vain after a wallet I couldn’t even see. I had lost my entire money for this trip. I was lucky my passport was back at the hostel and that I was safe and well. As everyone else partied in the fourth or fifth bar, I simply walked alone alongside the river looking in vain for my wallet and camera. I knew it was gone forever. 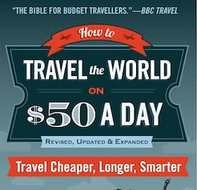 Travelling on a budget, I had blown the lot on one day of tubing. After walking for a while I realised I was in the middle of nowhere and it was getting dark. In Vang Vieng you can get all sort of drinks and drugs. 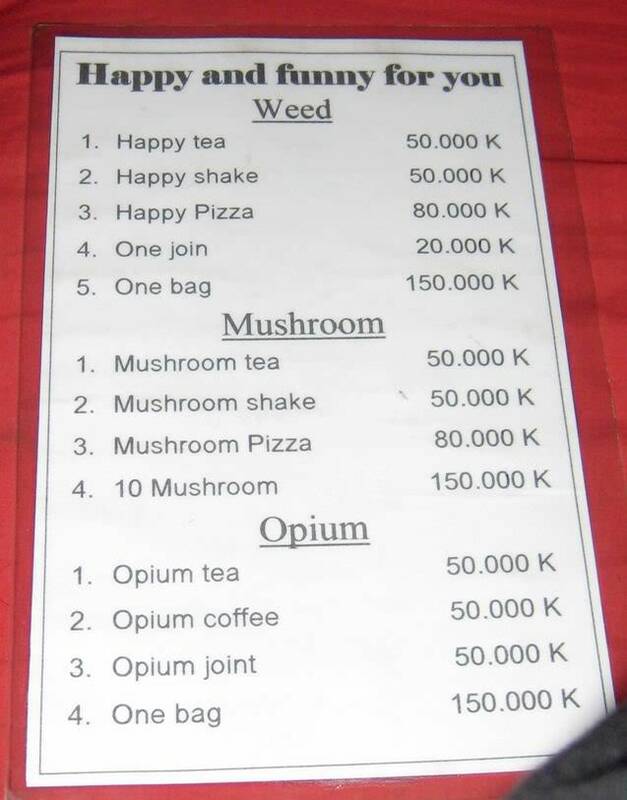 Mushroom and Opium shakes are the buzz. I met loads of people off their heads on drugs. – ONLY take money with you. BELIEVE ME – that’s all you need!! – DON’T take a waterproof bag – they are useless! ** To cap it all off and ruin a horrendous trip, I lost my blue hat just before leaving Vang Vieng. 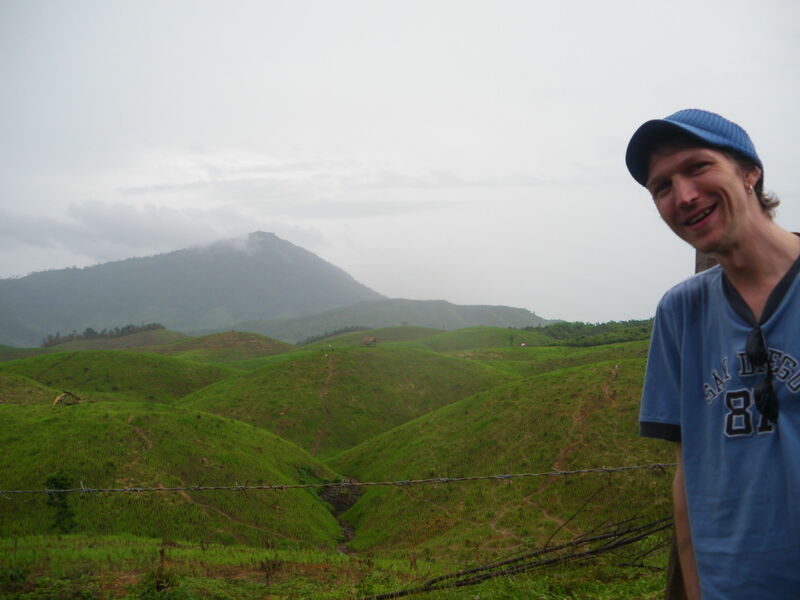 My Blue hat had travelled the world with me (and is in the above photo). I then deleted an e-mail address for a US guy who sent me photos of Vang Vieng, meaning I have no photos of my own from my entire time Tubing and afterwards! 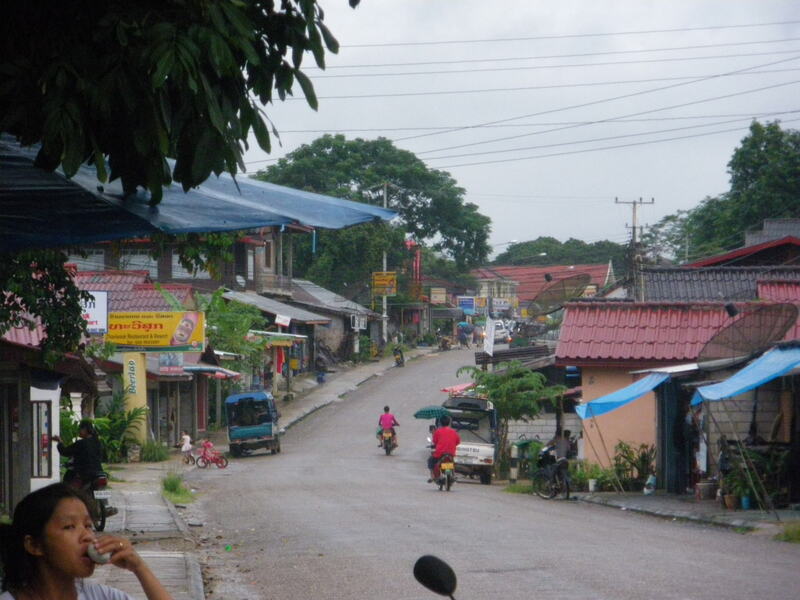 Plus I got an ear infection in the Nam Song…it really was a lesson in how not to go tubing in Vang Vieng Laos…on with the show, don’t stop living – it’s still a lifestyle of travel! 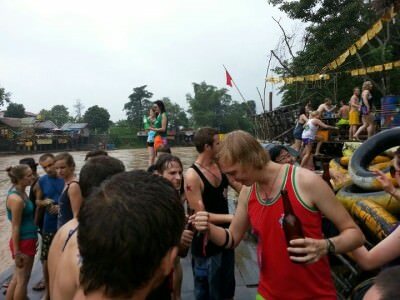 This entry was posted in Asia, Laos, Vang Vieng and tagged Asia, Belfast, HONG KONG, Irish Coffee, Lao, Nam Song River, Tubing, VangVieng. Bookmark the permalink. Very true words mate. I have seen this with my own eyes and luckily came away unscathed. 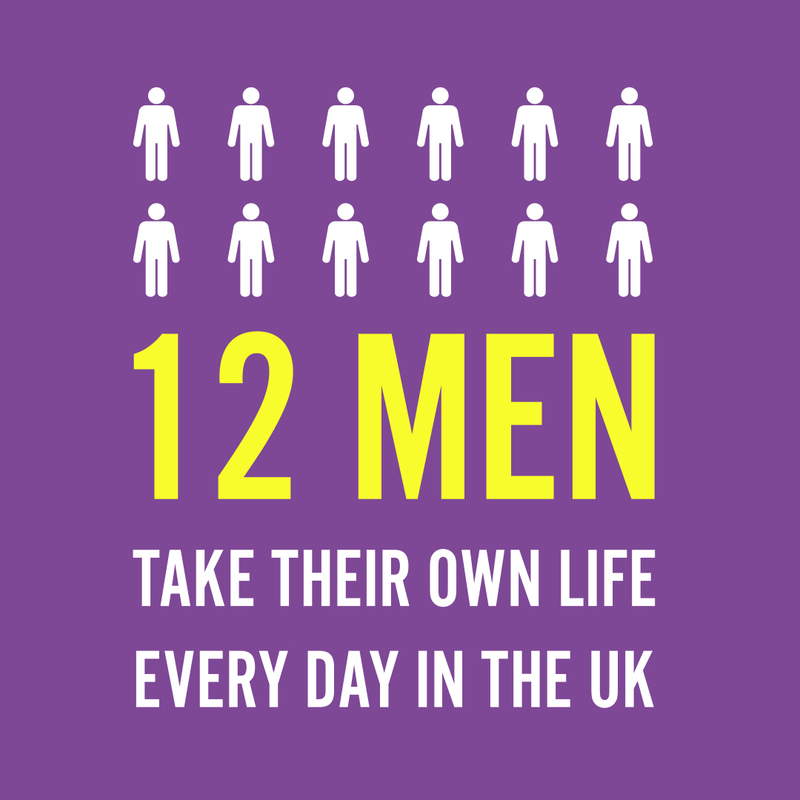 Many others have nasty incidents. Especially falling from height on the rope swings.